I find it amazing how all too often big corporations build these massively impressive structures only to later decide that maybe putting some environmental consideration behind the design would have been an intelligent move to make. This is not the case for the World Trade Center in Bahrain. Winning the 2006 LEAF award for Best Use of Technology, “this 240m tall building … is a best striking example of a green building” (EcoFriend, 2011). Solar Feeds has named it the number one coolest examples of a green building with reason. Built as a “modern interpretation of traditional Arabian wind towers, where the shape of the structure harnesses the onshore winds of the Arabian Gulf, the towers’ architecture provides a source of energy for the building that is renewable and cost effective” (Go Green, 2012). Due to the design of the building, the wind is easily directed between the two towers, maximizing the airflow through the turbines. The two towers are connected by three skybridges that each hold one turbine. With all three turbines, they “are expected to provide around 10-15% of the power for both towers, representing about 3.5% the total cost of the project” (Chapa, 2008). To top it off, the annual power that the three turbines produce annually (1.3 GWH) is actually “sufficient to power 300 homes per year.” And that’s just through operating only 50% of the time. 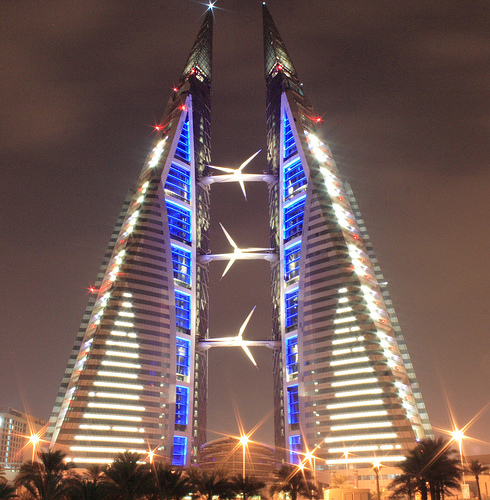 Since April 8, 2008, when the turbines were first switched on, they have been saving the Bahrain World Trade Center money and energy ever since. Talk about a smart move. What if all the big power companies started to design new buildings with the environment in mind? What if all these natural disasters that continue to wipe out entire cities weren’t just thought of as heartache, but as an opportunity for new ideas to come forward on how to build the next green building? Eco-buildings no longer are the ugly ducklings of infrastructure – they are slowly becoming the most sought after and innovative structures on the planet. Go figure. Thanks for that!! I find that very interesting how all this information came up regarding the greatness of such a structure and nothing popped up to say that they are no longer in use. Any chance they’ get them up and running again?